The May edition of Cycle Sport features an interview with Pat McQuaid, the president of the Union Cycliste Internationale. 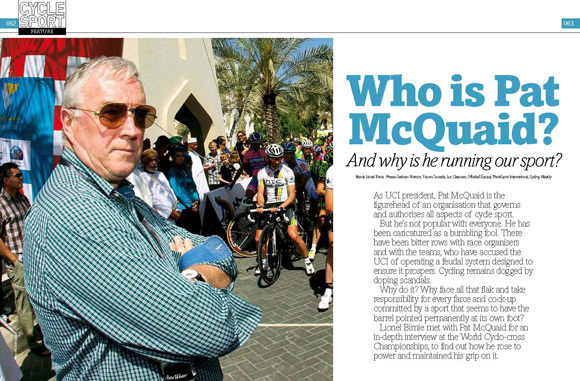 Here, journalist Lionel Birnie gives some background to the extensive magazine feature that seeks to answer the question: Who is Pat McQuaid and why is he running our sport? It took quite a while to set up a face-to-face interview with the president of cycling’s governing body. Almost a year lapsed between the first email request to the UCI’s communications manager, Enrico Carpani, and the day I sat down with Pat McQuaid at the cyclo-cross World Championships in Belgium at the end of January. They were not obstructive, particularly, and they didn’t ever decline an interview, it’s just that every time we began to get somewhere, it went quiet again. Having been to the UCI’s headquarters in Aigle, Switzerland, in August 2010, to see the receipt for the Sysmex machine the UCI says it purchased with Lance Armstrong’s donation, I was keen to meet on neutral territory. To be fair to the UCI, that contributed to delay as much as anything. But I could be forgiven for wondering whether McQuaid wanted to avoid me. Like many similar organisations, particularly those that are unused to scrutiny of their activities, the UCI can be sensitive to criticism. Last year, as the debate over race radios put the UCI and the professional teams on opposite sides of a barbed wire fence, McQuaid emailed to say that he found two articles I wrote on the subject to be objective. So why highlight these two brief and minor transactions? Well, because it begins to explain the way that McQuaid and the UCI operate. Before the interview, Carpani wanted us to send a list of the questions we wanted to ask McQuaid. We declined to do this. Carpani countered that he was keen to avoid repetition of questions that McQuaid has already answered numerous times – specifically about doping, about Lance Armstrong’s donation and about the UCI’s purchase of the blood-testing Sysmex machine with the money. We agreed that we would not ask identical questions to those already in the public domain and we gave an indication of the general areas we would like to discuss, explaining that sending questions in advance is not something Cycle Sport has ever done. But we accepted that asking McQuaid questions he has faced before would enable us to gain little insight. While I am sure sections of the internet would have wished for a gladiatorial interview, very little would be gained from a conflict. After all, he is no more likely to suddenly admit that the governing body’s relationship with Lance Armstrong was too cosy and inappropriate than Tony Blair or George W Bush are about to admit that the war in Iraq was a mistake based on flawed evidence. Talking with McQuaid for almost two and a half hours perhaps revealed more about the way the UCI works than he realised. McQuaid, like anyone who has grappled their way to the top of a global sports governing body, is a politician. The impression I was left with was that McQuaid is very well prepared. I recognised sections of his answers as he spoke and was impressed to find that some answers were almost word-for-word deliveries of those given in previous interviews. However, there are gaping great holes in some of his answers. Contradictions are easy to find – sometimes in the same sentence. He was genial and far less aggressive when challenged than I had anticipated. I found myself thinking that I’d far rather have a conversation about cycling over a pint with Pat McQuaid than have him running the sport. The problem with the UCI is that it is in a position of absolute power. It runs the sport for no better reason than that it has always run the sport. Its president was nominated, backed and manoeuvered into power by its previous president. The system and structure of the organisation means that the people within it have to play the game. Keep your head down, don’t rock the boat or you’ll end up overboard. Sylvia Schenk is a warning to anyone who wants to question the way things are done. The president appoints the members of the various commissions. And when you ask who the UCI is accountable to, the answer is, basically, that it is accountable to itself. McQuaid’s tenure has been controversial almost every step of the way. There has been the very public and bitter row with the organisers of the major races, ASO and RCS. Now they are in dispute with the teams. But because they are autonomous, it doesn’t matter what the teams, the riders, the race organisers, the media or the fans think. All that counts is what the UCI thinks. If the UCI doesn’t listen, it’s because the UCI doesn’t need to listen. Who is taking it to task? The UCI is joined by golden handcuffs to the IOC. As much as McQuaid may dislike the criticism, some of it quite personal, the bottom line is that it’s water off a duck’s back. The UCI exists to ensure that UCI continues to exist. The people seeking regime change within cycling’s governance need to grasp that fact first. Cycling needs a strong, independent governing body that understands the importance of running a fair show, not just the importance of running a show that’s seen to be fair. The people who oppose the UCI’s current management – chiefly the teams – ought to agitate for a top-to-bottom reorganisation of the UCI’s structure. They should argue for a more open election system, a more transparent way of electing people to key positions. Because at the moment, they are playing the man, rather than the ball. A final thought. They say of politicians that anyone who seeks office should automatically be disqualified from holding office. The same goes for the people in positions of power at sports’ governing bodies. 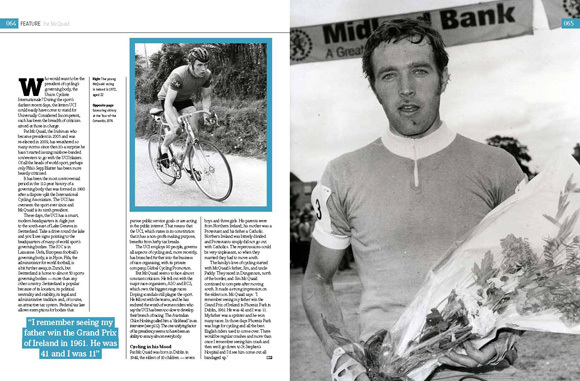 Lionel Birnie’s in-depth and extensive interview with Pat McQuaid is in the May edition of Cycle Sport, in British newsagents from Wednesday March 14, and later in the US.